New Bristol Brewery will be closing Bristol Beer Week at their awesome refitted brewery and tap room. 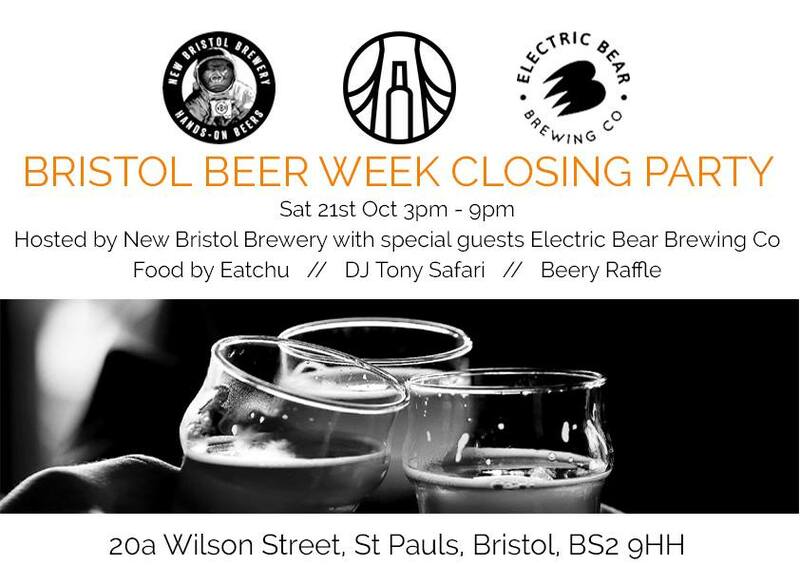 There also be helped out by Bath based (but Bristol regulars) Electric Bear, with whom they have brewer a special collaboration beer. If you haven’t visited or seen the New Bristol tap room, you’re in for a real treat. It has a mini-alpine chalet that houses the Bristol Brewery School, communal tables covered in sheepskin rugs, a new bar and even a wood-burning fire. Whatever the weather October brings us, this is sure to be the perfect venue to close out Bristol Beer Week. Ourselves and Electric Bear will have some very exciting new beers on including our Squid Ink Gose and our White Chocolate Stout. DJ Tony Safari has travelled down, from up north, to play his fiunky grooves and we've got a 'beery' raffle going on where you can win lots of beery stuff including a place on one our Bristol Brewery School courses. Phew it's gonna be good - so get the date in your diary and get those legs of yours over to one of the funkiest breweries in town! We cant wait.